(1971) "Singin' in Vietnam Talkin' Blues"
"Man in Black" (or "The Man in Black") is a protest song written and recorded by singer-songwriter Johnny Cash, originally released on his 1971 album of the same name. 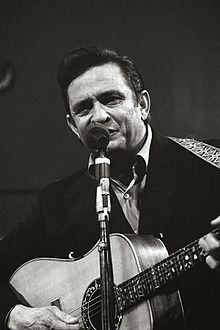 Cash himself was known as "The Man in Black" for his distinctive style of on-stage costuming. The lyrics are an after-the-fact explanation of this with the entire song as a protest statement against the treatment of poor people by wealthy politicians, mass incarceration, and the war in Vietnam. In the intro to his first performance of the song, Johnny Cash revealed he had talked to some of the audience members from Vanderbilt University that weekend, and was inspired to write "Man in Black," revising it a few times before the concert on Wednesday. At the end of the song he received a standing ovation. In 1993, Spanish rock band Loquillo y Trogloditas recorded a cover of the song in Spanish for their album Mientras respiremos. Monsen, Lauren (August 28, 2006). "Music Legend Johnny Cash Attracted Worldwide Audience". U.S. Department of State's Bureau of International Information Programs. "Johnny Cash sings "Man In Black" for the first time (with intro)". This page was last edited on 1 December 2018, at 03:44 (UTC).